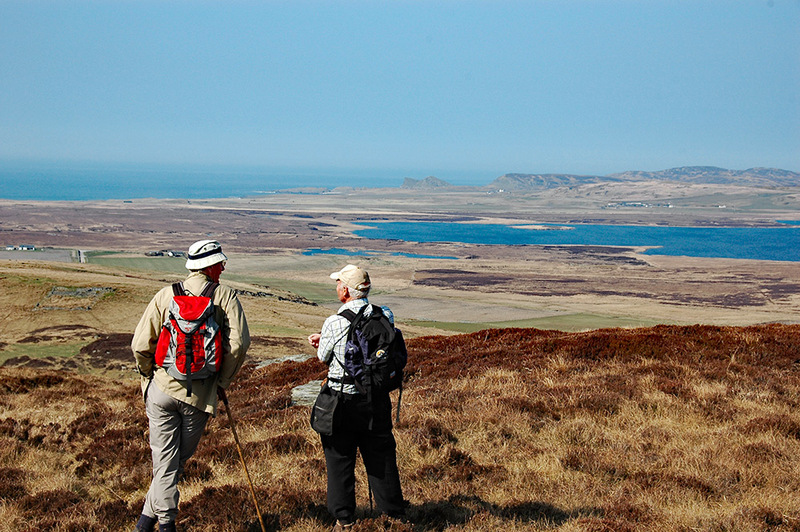 An impression from an Islay walking week walk on the Rhinns of Islay a number of years ago. Two walkers are enjoying the views from the hills above Rockside Farm (hidden behind the hills on the left, you can just see the access road) over Loch Gorm on the right and Saligo Bay in the distance. Unfortunately it was quite hazy, otherwise the views would have been even better. This entry was posted in Beaches, Freshwater Loch, Landscape, New Post, Sunny Weather and tagged Islay, Kilchoman, Loch Gorm, Opera House Rocks / Sleeping Giant, Rhinns of Islay, Rockside Farm, Saligo, Saligo Bay by Armin Grewe. Bookmark the permalink.